Activated Carbon Filtration | F-Series | General Carbon Corp.
General Carbon Corporation has added a fan to their user friendly Air Pollution Control Barrels to provide a quick and easy solution for simple VOC and odor control applications. The high volume aluminum fan mounted on the top of the General provides efficient control of minor point source pollution problems. The F-Series units are available in three sizes that cover a wide range of airflow requirements. The F-55 is our basic unit and will move 125 CFM of air at 4″ WC static pressure. The motor is 115/230 VAC, 1 pH, 60 Hz, TEFC and is weatherproof. 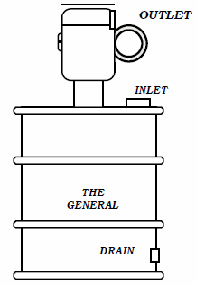 Wiring of the motor is not included to provide adaptability to site requirements. Loading the unit with impregnated carbon can improve the removal efficiency for Hydrogen Sulfide, Mercaptans, ammonia, formaldehyde, or other problem contaminants. Available Options: Specialty Carbons, Polyethylene Drum Liners, Damper, OSHA Safety Guards, Custom Inlet/Outlet Sizes, Full Selection of NEMA Rated Motors, Corrosion Resistant FRP Fans, Remote Mounted Fans and more.